Not so long ago you may have read about Chris Schwarz’s appreciation for the band saw blades he purchased through Bandsawbladesdirect.com, if you haven’t check out his May 10, 2012 blog post “My favorite band saw blade”. Chances are, you’re probably like many other woodworkers who know when Chris is talking about a specific tool, manufacturer or even a retailer, there’s a good reason for it. 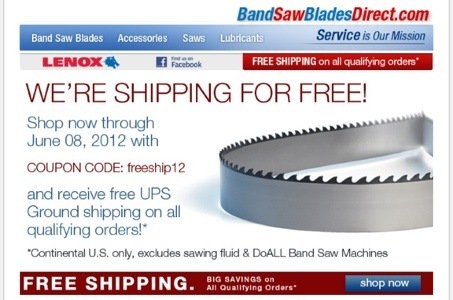 I recently received an email notification from Bandsawbladesdirect.com informing everyone they’re offering FREE SHIPPING for a limited time on new orders. Hurry, this offer only lasts until June 8, 2012! And it’s not only Chris who’s heaping praise on them for great blades, I have one too and really enjoy using it whenever I can. For more information visit Bandsawbladesdirect.com today. Just for complete transparency, I use to work with the spouse of an employee at Bandsawbladesdirect.com. So I received my first blade from them free of charge…but I’ll more than gladly pay for all the rest of them.